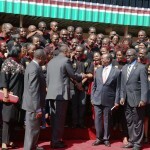 President Uhuru Kenyatta today flagged off the first batch of 170 Kenyan health volunteers to help contain the deadly Ebola in Sierra Leone and Liberia. Volunteer medics, including nurses, doctors and laboratory technicians, trained on detecting and management of the disease, form part of the African Union Support to Ebola Outbreak in West Africa (ASEOWA). Speaking at State House Nairobi, the President said Kenya is committed to Africa’s resolve to provide solutions to the continent’s challenges. He has fulfilled its pledge of USD 1,000,000 (sh.90 million) financial support to Sierra Leone, Liberia and Guinea to fight Ebola. He added that the country will fulfill its commitment to contribute 319 health workers to join the Ebola response in West Africa as pledged during the 10th Ordinary meeting of the East African Community Sectoral Council of Ministers in October last year. “The outbreak of Ebola in West Africa last year presented a profound global crisis. It seriously challenged the affected nations and regions, our continent’s and the global community’s capacities and approaches to humanitarian emergencies,” the President said. He said the country has a proud and exemplary name in peacekeeping, diplomacy and voluntary international service in times of crisis. President Kenyatta thanked the medical volunteers for the bravery, resolve and nobility of spirit to be front-line staff in tackling the Ebola virus from the source. “This is a time of great pride for all Kenyans, for you and for me. I stand before courageous and selfless volunteers who have taken a bold stand to bring the spirit of African solidarity into life and action,” he said. Adding,” You join a roll of distinguished Kenyans who have served their African kin selflessly under daunting circumstances”. The President said the volunteers are the demonstration of the potential Africa holds to overcome its challenges and boldly enter a brave new world of progress, peace and happiness. “The greatest resource we discovered as a continent is confidence: the confidence in our own ideas, solutions and capacities, President Kenyatta said. He said it is humbling and inspiring to know that the country boasts of innumerable committed, “compassionate and courageous professionals whose love and empathy literally knows no boundarie”s. He told the medics; “You are the demonstration of the potential Africa holds to overcome its challenges and boldly enter a brave new world of progress, peace and happiness”. Deputy Chairperson of the African Union Commission Erastus Mwencha and Health Cabinet Secretary James Macharia signed a memorandum of understanding covering the airlifting, insurance cover and other welfare issues affecting the volunteers. The health workers will be airlifted to West Africa later today by Chartered Kenya Airways planes. The President urged the Airline’s management to consider resuming flights to West African destination suspended following the outbreak. Mr Mwencha commended the President and his government for “always standing tall” in solidarity on finding solutions to matters affecting the continent. 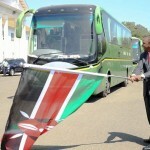 Others who spoke were included Mr Macharia and Foreign Affairs CS Amina Mohamed.